I originally wrote this piece for CruiseCritic members who were traveling on some of my other Asian cruises. I lived and worked in Japan for a little over two years, a while back. I do miss some of the great food tastes. Here are some suggestions for on-shore foods that I will be looking for on this trip when in Hakodate, Yokohama, Tokyo, and Nikko. The dishes I am presenting here are mainly Street Food or small (inexpensive) restaurant fare. There are many more possible choices but these will be my main search quests. When you are off-ship in Japan why not try a couple of these delights. 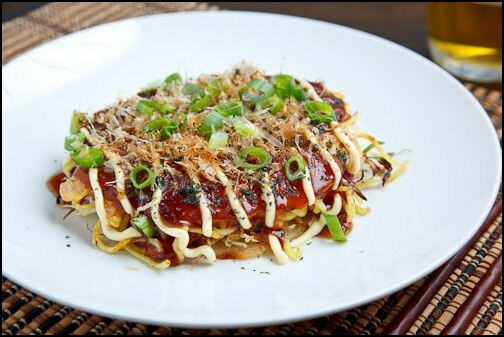 Okonomiyaki - are savory Japanese pancakes filled with meat, seafood and vegetables. They can be topped with mayonnaise, katsuobushi, nori, ginger pickles and a sauce similar to tonkatsu sauce. Yaki Imo - are baked sweet potatoes cooked over a wood fire. 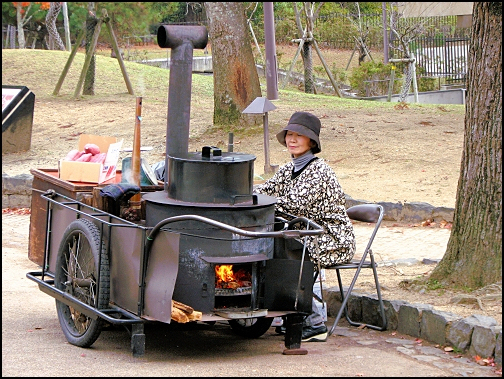 Yaki Imo trucks and carts fitted with wood stoves can be found all over the Japan. The trucks may drive around slowly repeating "yaki imo ... yaki imo ... yaki imo" on a loudspeaker. This is either annoying or charming depending on your outlook. Most people become nostalgic about them. 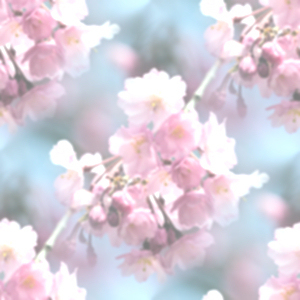 They are an aspect of old Japan that's quickly fading into the past. 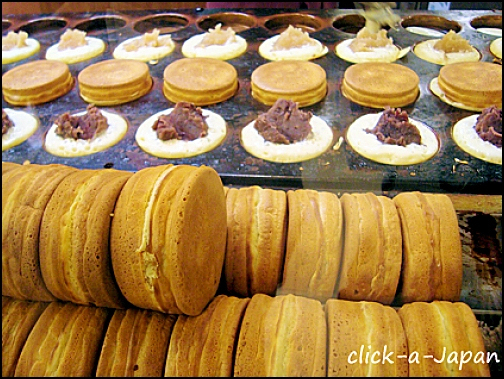 Imagawayaki - is a Japanese dessert made with batter cooked in a special pan with a circular shape. It's traditionally filled with red bean paste but in recent years ingredients such as custard, fruit jams, meat, potatoes and curry are also common. 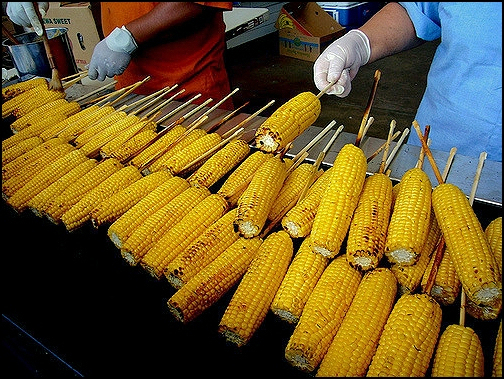 Tomorokoshi - Corn grilled with miso, butter, mirin, honey, and soy sauce on a stick. 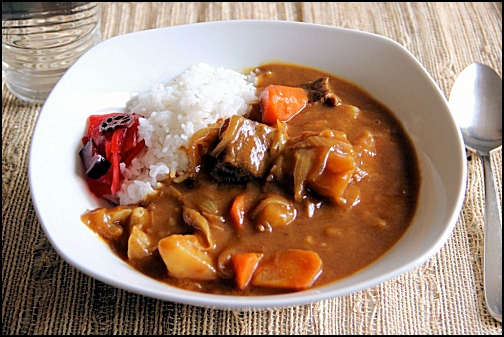 Japanese Curry Rice - Japan is obsessed with mild curry similar to a spicy gravy. It's a staple of the Japanese diet. It's common to eat it twice a week. It has a different taste than Indian Curry. 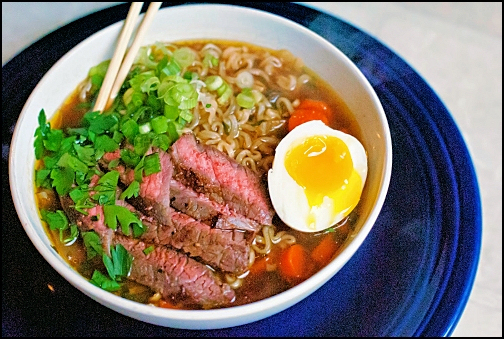 Ramen - is a Famous Japanese dish. It consists of Chinese-style wheat noodles served in a meat-or fish-based broth, often flavored with soy sauce or miso, and uses toppings such as sliced pork, dried seaweed, menma, and green onions. 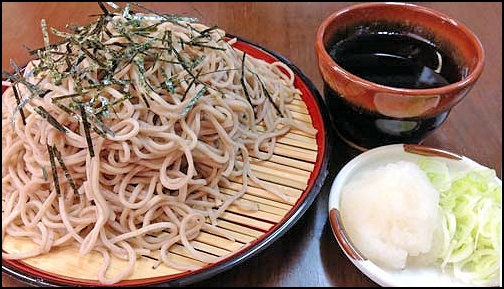 Zaru Soba - is a chilled noodle dish made from buckwheat flour and served with soy sauce based dipping sauce called tsuyu. 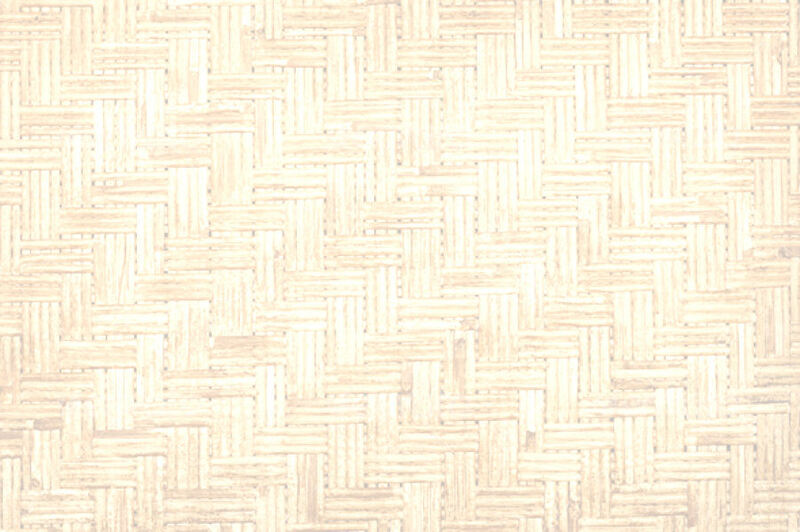 The word zaru means "a strainer" in Japanese and the name of the dish was derived from the way the noodles are served over a bamboo strainer during Edo Period. Takoyaki - literally translates to 'octopus fried,' an appropriate name for this popular dish consisting of fried balls of batter filled with octopus, green onions, ginger, and tempura pieces. The crispy takoyaki balls are usually topped with more green onions, along with fish shavings, mayonnaise, and a special takoyaki sauce, similar to Worcester sauce. Although the octopus makes the dish sound bizarre, it is actually surprisingly mild and pleasantly gooey. Takoyaki vendors are particularly prevalent on the streets of Osaka, where the dish originated, but can be found in pretty much any Japanese city. Yakisoba - is made with ramen-like noodles, which are stir-fried with small pieces of pork and various veggies like cabbage, carrots, and onions. 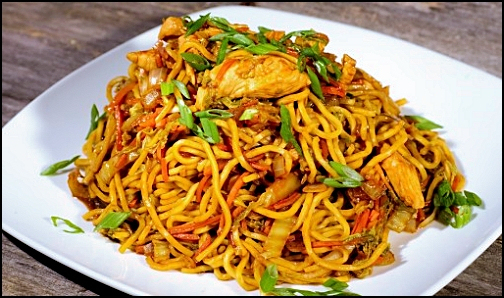 Based on Chinese chow mein, this comfort-food dish is seasoned with a special sauce which gives the noodles their distinct tangy and spicy flavor. Perfect as a light meal or snack, the noodles are typically topped with seaweed flakes, fish flakes, and red pickled ginger. You'll also sometimes see the noodles served hot-dog-style in a bun, topped with mayonnaise and pickled ginger. 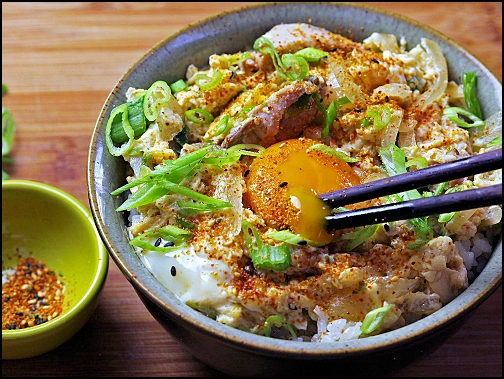 Oyakodon (Oyako Donburi) - literally "parent-and-child donburi", is a donburi, or Japanese rice bowl dish, in which chicken, egg, sliced scallion, and other ingredients are all simmered together in a sauce and then served on top of a large bowl of rice. Katsudon (Katsu Donburi) - is a popular Japanese food, a bowl of rice topped with a deep-fried pork cutlet, egg, vegetables, and condiments. The dish takes its name from the Japanese words tonkatsu (for pork cutlet) and donburi (for rice bowl dish). 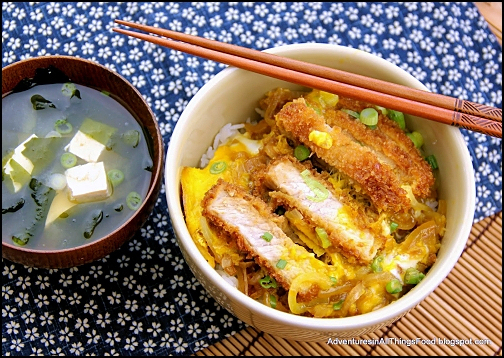 It has become a modern ritual tradition for Japanese students to eat katsudon the night before taking a major test or school entrance exam. This is because "katsu" is a homophone of the verb katsu, meaning "to win" or "to be victorious". It is also a famous gag of Japanese police films: many people think that suspects will speak the truth with tears when they have eaten katsudon and are asked, "Did you ever think about how your mother feels about this?" Even nowadays, the gag of "We must eat katsudon while interrogating" is popular in Japanese films. 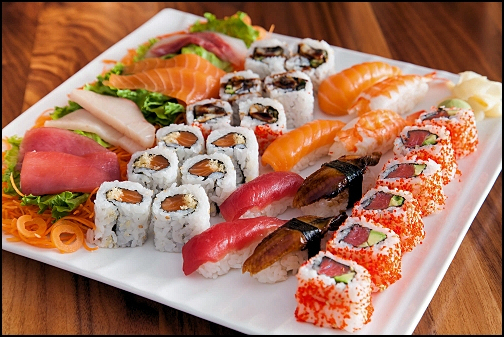 Sushi - no need to explain. 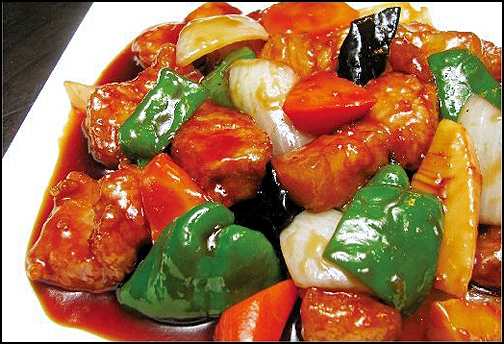 Subuta (Vinegar Pork) - The Japanese version of a Sweet & Sour Pork Chinese dish which tastes a little different than what we are used to in the US. 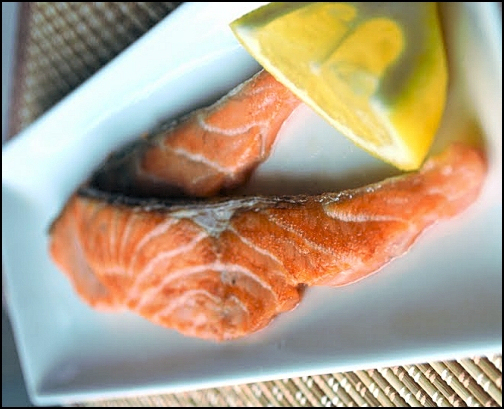 Shiozake - Highly salted dry salmon. A little goes a long way. 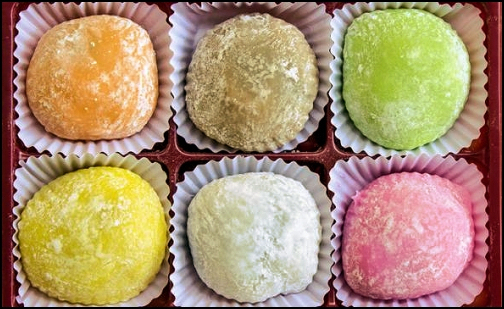 Mochi - a Japanese rice cake made out of special glutinous rice pounded into a paste and molded into a shape. During the mochitsuki event in Japan, otherwise known as the mochi pounding ceremony, mochi is made. In Japan, it is a traditional food mainly eaten during the Japanese New Year, although it is served throughout the year. Mochi can be made savory and sweet. The sweet version is known as Daifuku, which are round glutinous rice balls filled with sweet ingredients such as red bean or white bean paste. Tororo Imo - You most probably want to pass this one up. I love it, but chances are you won't. Besides it rarely appears on restaurant menus and most Japanese families prepare it at home so it would be difficult for you to find in a restaurant. It is made from a naraimo potato (aka: Chinese yam, Chinese potato, cinnamon-vine, a few other names - Dioscorea polystachya) which is a unique tuber that grows three feet under ground and can be eaten raw. 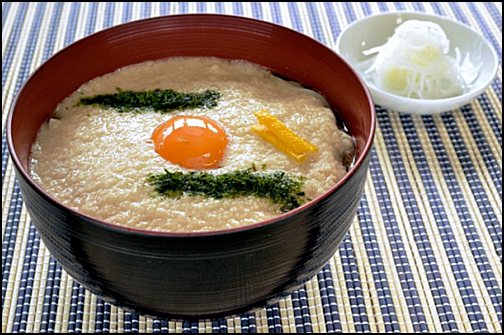 The potato can be grated, have some seaweed, wasabi & soy sauce added and topped with a raw egg to quickly create the Tororo Imo dish. It's not that you won't like the taste, but you probably have never eaten a food of this consistency before. 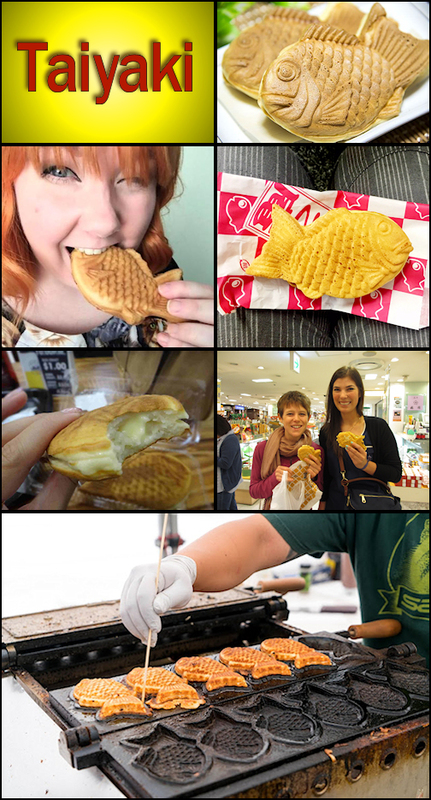 Taiyaki - A most enjoyable and highly popular street food which can best be described as a pocketed waffle in a fish shape with a multitude of fillings such as custard, chocolate (like Nutella), sweet red bean paste, ice cream, cheese, etc. - endless variations. It is made via special heated mass molds similar to waffle irons with the stuffing added just before the top and bottom of the molds are joined. They are similar to the Imagawayaki, mentioned earlier, but the pastry portion is more waffle-like and crispier. Some street vendors are even placing other food products in the interior pocket such as meat, fish, and vegetables expanding the taiyaki choices. My two favorites are the custard and chocolate. But since, after buying one, as they are quite inexpensive, you are bound to pass another shop further down the street and you will be ready to experiment with another flavor. "Bet you can't eat just one!"